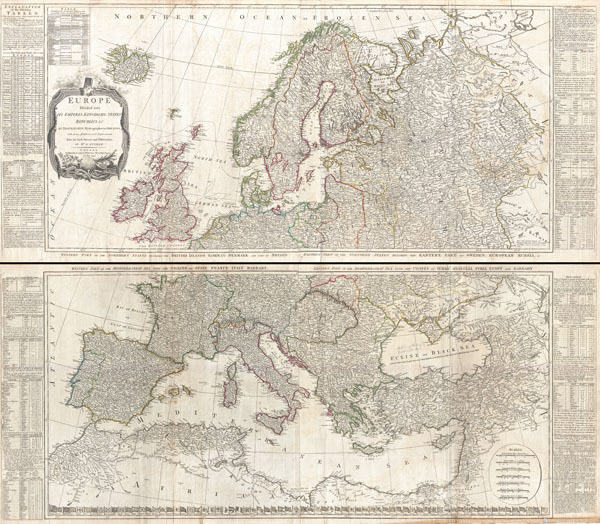 Europe Divided into its Empires, Kingdoms, States Republics, & c.
A large and dramatic 1794 wall map of Europe on two panels. Published by Laurie and Whittle based the work of the important cartographer J. B. B. D'Anville. Upper sheet covers from Iceland to Russia and from the Arctic to Calais and Astrakhan. The southern sheet covers from Portugal eastward as far as the Caspian Sea, and from Hungary south to northern Africa. Includes Iceland and parts of Asia including Turkey and Palestine / Israel. To either side of the both maps are tables regarding distances, statistics, and population. Offers color coding in outline style and notes both political and topographical features, including mountains, rivers, cities, and undersea banks and shoals. Along the bottom of the map is a series of miniature naval flags for each of the many countries and cities or the world, ranging from Germany to Japan to Ethiopia. The flag of the fledgling United States, with thirteen stars, appears in the lower right hand corner was clearly added as an afterthought. Prepared from work by D'Anville and published by Laurie & Whittle in Kitchin's 1794 General Atlas. Very good condition. Original folds. Light toning - else very clean. Rumsey 0411.004, 0411.005, 0411.006 (composite). Phillips (Atlases), 4300, 6008-36-37. Bancroft Library G5200 1794.A5. Shirley, R., Maps in the atlases of the British Library, T.LAU-1c (1799 ed.). National Maritime Museum, 375 (3rd ed. 1801).